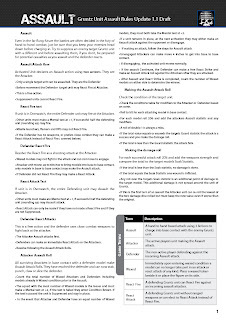 Rottenlead: New Assault Rules 1.1. This week has been a busy one for Gruntz activity. I completed some filming and editing of a couple of Gruntz play guides for Youtube over the weekend and put them through the editing process on Sunday and last night. The new advanced assault rules are up and running and will be followed by two more later this week, on rapid fire, card based activation and some interesting news on the Army Builder application. The new Advanced Optional Assault rules have been in play test since the release of v1 of the rules in July 2011 and got their first public outing at the Salute wargames show this April. They were intended to stay true to the simple to learn and play approach of Gruntz but add some more detail for the close assault activity. Defenders have an opportunity to react to incoming attacks which is dependent on what condition they are in when a unit assaults them. Running a squad at a well prepared defending unit, who are ready to fire automatic laser or projectile weapons at you is very dangerous but if you manage to suppress the target unit by shooting at them from other units in your force you can make it much easier to overrun them with an Assault. 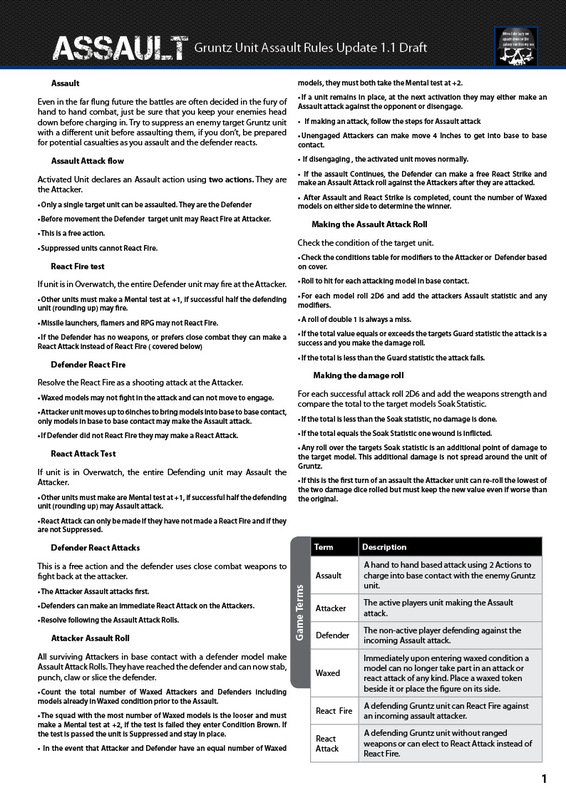 I am calling them advanced rules but they are actually relatively simple and not that far from the original assault. 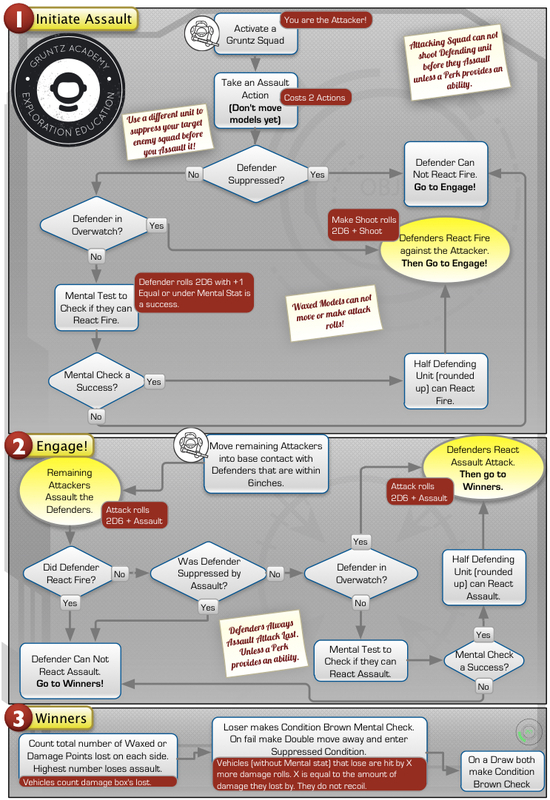 Don't be afraid of this chart, it might look complicated but you won't need to reference it after a couple of Assaults play throughs. The most important item for me is speed of play and keeping tables out of the game. 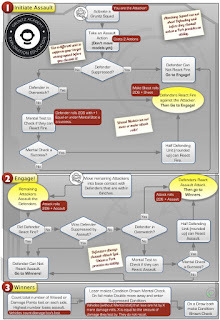 I believe after a couple of plays you won't need to reference the process chart but it will certainly help for the first couple of engagements that you use these advanced Assault rules. They will be finding their way into the 1.1 release. At some point over the next 10 days there will be some news on the Army Builder application which will be shared in another Youtube episode. I am ready to take comments and feedback on them and would suggest that before diving in with comments that you take time to listen and absorb the Youtube video, read through the chart and perhaps try it a couple of times in a test game. I am always happy to keep refining down and adding clarification from player input. Armchair Generals are also welcome! For all feedback on this release, please use the Forum thread here. Haven't gotten a chance to try the assault rules yet, but feel confident after watching the video. Thanks. I think it's great that you're giving these video updates. What I really want to know right now, though, is where you got those shields for the spider bots. I'm not usually into plastic doodads on the table but I think these look great and would make me remember my shields (which I never do until the turn is over).